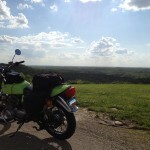 I took advantage of the warm weather in May for a mid-week motorcycle adventure. 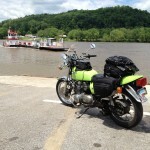 Like most motorcycle adventures, I did not plan ahead a specific itinerary. 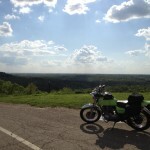 I simply pointed my 1978 Kawasaki KZ650 motorcycle in a general direction and went where the roads would take me. I knew that I wanted to make use of the southern Ohio roads again on this trip, but also knew that I needed some new tires for my vintage ride. 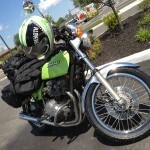 I stopped at Shop Dog Cycles in Hilliard, Ohio to get a new set of Spitfire S11 sport touring tires put on. Shop Dog Cycles is a one-man affair, but owner Ryan puts great care in his work. An older bike like mine meant more work to pull 34 year old tech apart, but Ryan did so with patience and professionalism. I have to say, the back country riding with those new tires was certainly smoother. While in Hilliard, I encountered one of their sets of double roundabouts. 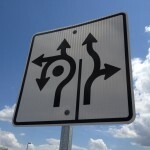 The road signs for the roundabouts look like a mess of circular arrows, but once you’re in the middle of it all, it makes sense. The roundabouts make for an interesting alternative to the normal intersection with stop lights. While they require more work on the driver’s part, I think the extra attention required works to make the affair safer. Traffic constantly flows, versus the stop and go of a light, which is welcome as well. Leaving the Columbus area, I took off to the back country roads of southern Ohio. I hit most of the more famous roads here, like Route 555, 78 and 26. Route 26 feels like a roller coaster, with plenty of tight and sweeping turns, hills and spectacular views. Route 78 has plenty of twists as well, but I always find myself stopping at points just to take in the view when you get to the top of one of the hills and can see miles of rolling Ohio in all directions. One particular stop I did want to make on this trip was the Sisterville Ferry. 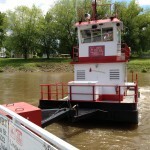 This ferry shuttles cars across the Ohio river between Fly, Ohio and Sisterville, West Virginia. 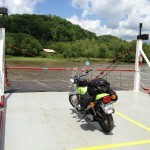 I crossed the border into West Virginia so that I could take the ferry back into Ohio. There’s something magically adventurous about crossing a river on a ferry with a motorcycle, and as soon as I heard about the ferry, I had to make the detour. Although a short trip across the river, it was absolutely worth it, if only for the view in the middle. The ferry crosses as one of the longer straight sections of the river, giving you a view down the river in both directions for miles. 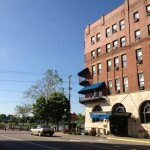 As the sun started to set, and the clouds began to darken, I made my last stop at the historic Lafayette Hotel in downtown Marietta, Ohio. 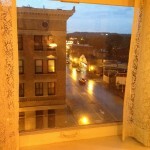 The hotel sits next to the Ohio river and offers many spectacular views from the rooms. 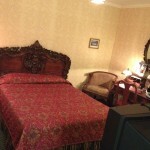 The rooms themselves are like a time capsule from the 1940s with their furniture. Definitely a must stay if you’re in the area. 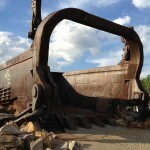 The next morning, I took the straight shot home up highway 77 north. It was another great trip, and I am glad I was able to take the time to experience it. I can’t wait for the next adventure!